Tom Field, who made 46, in action for the Kingfishers at Stratford. Picture by Marcus Mingins. 3018003MMR4. www.buyphotos247.com. REDDITCH Entaco’s inconsistent season continued on Saturday as they were beaten by seven wickets at title-chasing Stratford in Birmingham League Division Three. 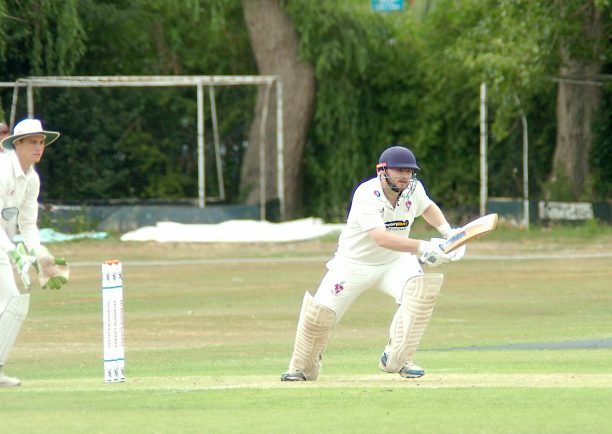 However, with Redditch safely in mid-table following their return to Birmingham League cricket, they have the chance to test themselves against another of the division’s leading lights when they host second-placed Stourbridge on Saturday. Opener Tom Field’s 46 ensured Redditch began solidly against Stratford after they had elected to bat first. However, wickets fell around him as none of the other top five managed to hang around too long. When he was dismissed to leave the visitors 81-5, the lower order battled to eke out the runs but they were finally dismissed for 158 in the 53rd over. James Urquhart (4-32) improved his impressive tally of wickets for the season to 43 while Archie Walker joined in with 3-61. Dexter Purser then smashed a thrilling 91 off 66 balls including 16 fours and one six to help Stratford boost their title hopes with a convincing victory. The returning Ghulam Moyhuddin took 2-41. The 2nds gained a winning draw against visitors Stratford in an entertaining Second XI Division Two South game at Bromsgrove Road. Redditch scored 225-8 off 50 overs with Stefan Jagielski leading the way with 79, supported by Raheem Basharat (47) and Anis Suleman (44). Stratford skipper Will Noble made a fine 88 but Redditch bounced back through medium-pacer Steve Du Cros who took 4-40 to restrict the visitors to 205-6. Redditch 2nds visit Stourbridge on Saturday. Elsewhere, there were heavy defeats for the 3rds and 4ths against Highley and Feckenham respectively. The 3rds were bowled out for just 119 with Eliot Ward taking 6-28 before Highley reached their target in just 27 overs for the loss of four wickets. The 4ths suffered in the heat at Feckenham as the home side scored 347-5, with Jon Dean scoring 148, backed up by half centuries from Angus and Alex Hardy. In reply Redditch struggled and were bowled out for just 163 as Liam Clarke top-scored with 51. On Saturday the 3rds travel to Cutnall Green and the 4ths entertain Pedmore at the Entaco.